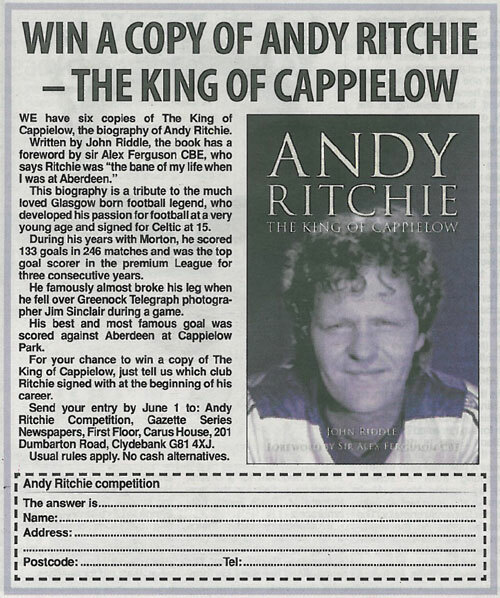 Brief Description: The King of Cappielow, with a fitting Foreword by Sir Alex Ferguson CBE, is a tribute to the much-loved Scottish footballing legend, Andy Ritchie. He was born in Glasgow in 1956 and developed a passion for football from a young age. As a teenager he went for trials with several English clubs, but in the end joined Celtic in 1971 at the age of 15, signing professional forms in 1973. In 1976, after one too many alleged disputes with manager, Jock Stein, he became part of a transfer deal, moving to Greenock Morton in exchange for their goalkeeper, Roy Baines. And thus, for the next seven years, Andy Ritchie built his reputation as the ‘King of Cappielow’. 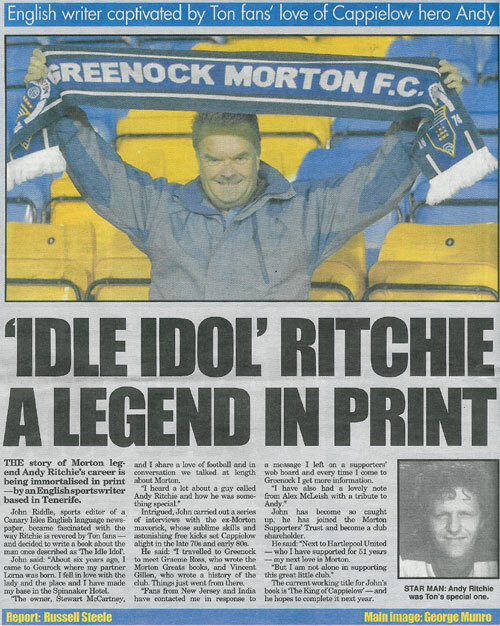 Adored by the fans, but attracting less regal labels by the media, such as the ‘Idle Idol’ and the ‘Ambling Alp’, due to his large build and less than energetic footballing style, Ritchie proved his incredible ball skills time after time, netting 133 goals in 246 matches and achieving the honour of top goalscorer in the Premier League for three consecutive years. He became renowned for his ability to curl the ball into the net from free kicks, particularly corners, an expertise he purportedly developed from watching the Brazilians training for the 1974 World Cup, even though he sadly never got to play for Scotland. On leaving Morton, Andy Ritchie played briefly for Motherwell and was player/manager at Albion Rovers for a season before retiring from football in 1985, aged 28. The call of Scotland and football ever strong, he eventually returned to his roots from a management position at the Barbican in London and, after some time as a football scout, he took on his current role of SPL delegate/match observer. Although he received the coveted Football Writers’ Player of the Year award in 1979, he is yet to be inducted into the Scotland Hall of Fame. Maybe with this publication his time for full recognition will come. About the Author: John Riddle was born in Almondbury, Huddersfield, but shortly after he was born the family moved back to their hometown of Hartlepool. John was educated there at Jesmond Road Juniors, Dyke House and the College of Further Education. He obtained a place at Leeds University at the Department of Extra Mural Studies and graduated in 1973. He returned to the north-east and ‘did time’ as a Prison Probation Officer at HMP Kirklevington, Frankland Maximum Security Jail and the notorious ‘H’ Wing at Durham Prison, where he once had tea with Rosemary West and the late Myra Hindley - but not by choice, it was part of his job! 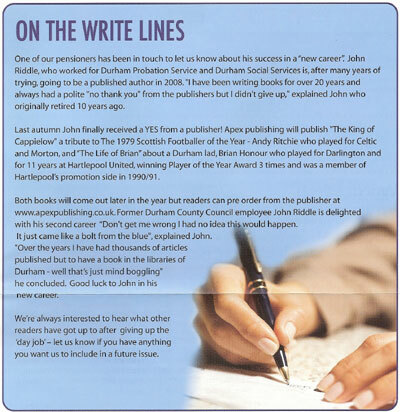 He was seconded to the Durham Prison marketing team and sold the football nets made in the jail to League clubs. Two sets were sent to the Scottish FA and Wembley Stadium with the national flags woven into the background. 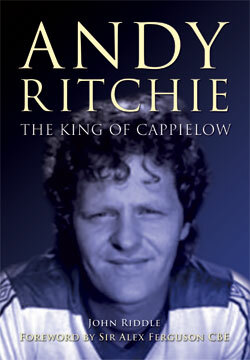 It is a pleasure to write the foreword to this book ‘The King of Capplielow’. Andy Ritchie was the bane of my life when I was at Aberdeen. He would continually score free kicks against us. So much so that we spent a whole week training in ways to defend against his great ability to score from all sorts of different positions at free kicking. We tried everything to stop this, we tried two players on the posts, we tried leaving a gap in the wall so that our goalkeeper could see the ball. We tried everything but two goalkeepers which was unfortante that the rules did not allow it. Andy had a great talent and I can vouch for that as no one suffered more against it. In closing, I hope you enjoy this book as much as I did! SPORTS writer John Riddle left Huddersfield aged six months, but the lifelong Town supporter has never forgotten his roots. Now, Almondbury-born John, 60, is offering Examiner readers a first look at his two new sports books. 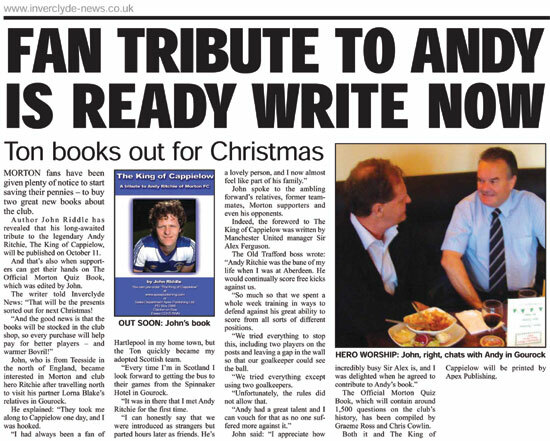 John, a sports editor for Canary Islands newspaper The Paper, has released The Life of Brian and The King of Cappielow. The Life of Brian – with a foreword by former England and Liverpool ace Peter Beardsley – tells the story of footballer Brian Honour of Hartlepool United. 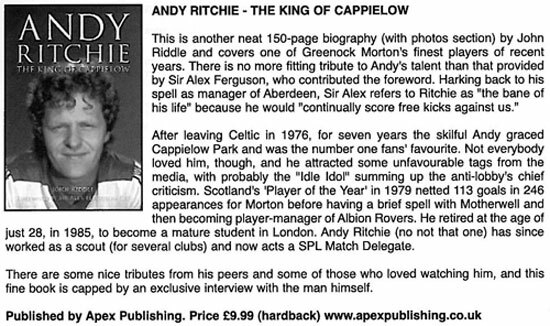 The King of Cappielow charts the career of ex-Celtic and Greenock Morton player Andy Ritchie (not the HTFC manager!). A longstanding Town fan, John travelled from his former home in Tenerife to the McAlpine Stadium to interview Steve Bruce – only to find he’d been sacked. Instead, he interviewed new manager Lou Macari. John, who now lives in Hartlepool, said: “I always check Town’s results first. I’ve thousands of books on them. SPORTS writer John Riddle is celebrating scoring an incredible hat-trick. 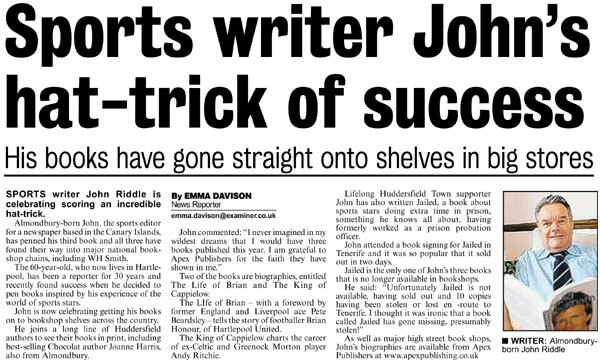 Almondbury-born John, the sports editor for a newspaper based in the Canary Islands, has penned his third book and all three have found their way into major national bookshop chains, including WH Smith. The 60-year-old, who now lives in Hartlepool, has been a reporter for 30 years and recently found success when he decided to pen books inspired by his experience of the world of sports stars. John is now celebrating getting his books on to bookshop shelves across the country. He joins a long line of Huddersfield authors to see their books in print, including best-selling Chocolat author Joanne Harris, also from Almondbury. Two of the books are biographies, entitled The Life of Brian and The King of Cappielow. The Life of Brian – with a foreword by former England and Liverpool ace Pete Beardsley – tells the story of footballer Brian Honour, of Hartlepool United. 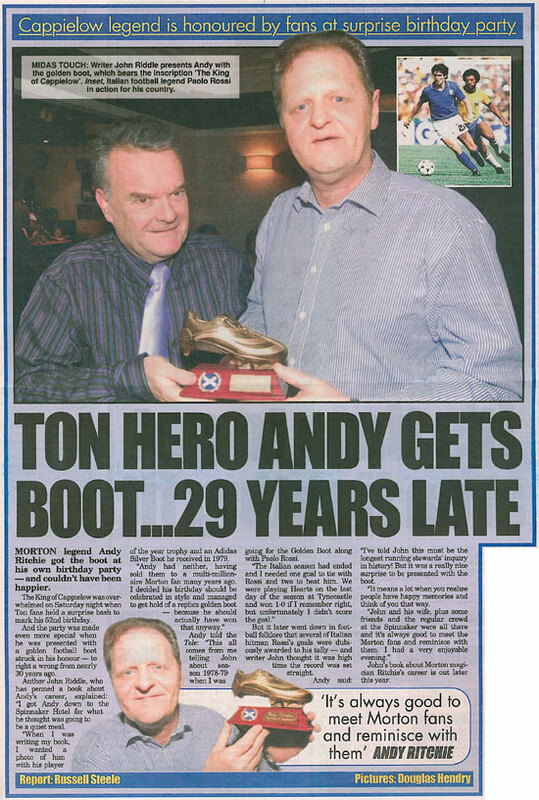 The King of Cappielow charts the career of ex-Celtic and Greenock Morton player Andy Ritchie. Lifelong Huddersfield Town supporter John has also written Jailed, a book about sports stars doing extra time in prison, something he knows all about, having formerly worked as a prison probation officer. John attended a book signing for Jailed in Tenerife and it was so popular that it sold out in two days. Jailed is the only one of John’s three books that is no longer available in bookshops. FOREVER a hero in Hartlepool, Brian Honour is to be the subject of a biography out in August. Inevitably it'll be called The Life of Brian. The man the locals know as Jackie spent three years at Aston Villa before being released because he was too small, then signed for Darlington on £60 a week. After 84 games, Cyril Knowles also freed him: too small. His first football memory, however, is of Stan Matthews coming to the family home in Horden to sign their John for Port Vale. Happily for Hartlepool, manager Billy Horner knew the adage about good stuff and little bundles, spotted him up the road at Peterlee Newtown and offered terms. Brian, now managing Bishop Auckland, spent 11 years as a Pool player and four on the coaching staff. 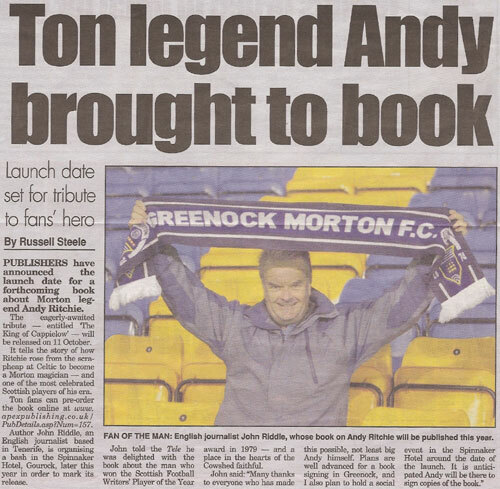 The book's by retired probation officer and freelance journalist John Riddle, Hartlepool lad, who's also compiling a biography of Morton legend Andy Ritchie. "The King of Cappielow" is expected in October. John Riddle was interviewed on Leith 98.8 FM. John answered questions about his book 'The King of Cappielow' on 'The Graeme Logan Show'. The King of Cappielow is an interesting read. Until recently although following the fortunes of Greenock Morton from a distance I have to admit I had not visited Cappielow Park until 2008. I was educated at the Greenock Academy and had heard people talking about this guy Andy Ritchie. I read this book about his life and then bumped into the legend in Gourock, my birthplace. He is as charming and entertaining as is portrayed in the book but I can imagine that his verbosity got him into trouble more than once with Jock Stein. I also can well understand why the people of Morton idolise this guy. He is charismatic and I have no doubt having watched a video of some of his goals that in his playing days he was larger than life itself. 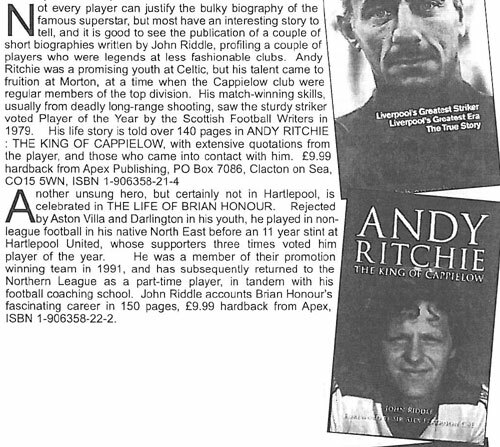 I think Andy Ritchie's life story would make a cracking film and the book itself is well worth a read. An excellent read, bringing back many fond memories for me. I found the book very interesting and well written. It is obvious that a lot of research has gone into this book. I am sure this book will be very popular amongst the Morton and Andy Ritchie supporters. 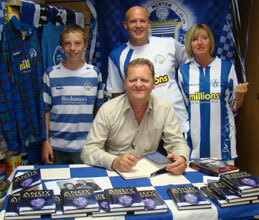 John Riddle and Andy Ritchie signed copies of their book 'The King of Cappielow' at Keystore, Gourock. 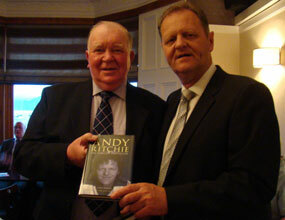 John Riddle and Andy Ritchie signed copies of their book 'The King of Cappielow' at The Spinnaker Hotel, Gourock. 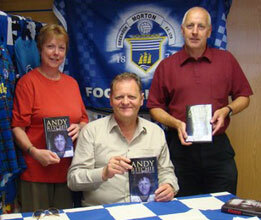 Andy Ritchie signed copies of his book 'The King of Cappielow' at The Greenock Morton Club Shop, Greenock. John Riddle talked about and signed copies of his books 'The Life of Brian Honour' and 'The King of Cappielow' at Hartlepool Library.